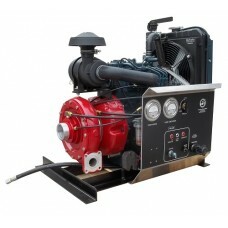 The MR version diesel powered pump gives you more pressure to meet the requirements of an initial attack. If you will be conducting public bids, kindly include Fire-End & Croker in your mailing or postings. Delivery/Shipping Availability: Item ships directly from manufacturer. Approximate delivery in 3-5 weeks. MID- RANGE 20 HP PRESSURE AND VOLUME PUMP This pressure/volume pump is the most suit..
MID-RANGE 18 HP PRESSURE AND VOLUME PUMP WITH FULL CONTROL PANEL This pressure/volu..
MID-RANGE 18 HP PRESSURE AND VOLUME PUMP This pressure/volume pump is the most suita..